the person the querent is interested in if the querent is single. When reading for a female querent, it’s important to remember that in terms of husbands, lovers, and crushes, the Lenormand Man usually represents the person the querent is with, rather than the person she wants to be with. So if she is in a relationship but wants to be with someone else, the Man will usually be the person she is in a relationship with and another card, such as the Dog, will represent the person she would rather be with. There are a lot of masculine cards in the deck and it can be confusing as to which one represents which male figure. The Man is usually dominant and will be the most important man in a female querent’s life, or will represent the querent if male. The Lily is often an older male figure, such as a father. The Dog is a male friend. The Bear can be a querent’s boss. The Rider is someone coming into the querent’s life. You can think of it in terms of a hierarchy where the Man is the most important and the Rider the least important male in the querent’s life. Career: You need to be strong and take charge. A man could play a significant role in your career. Possible jobs: On its own, this card doesn’t signify a particular job. If it keeps appearing in regards to jobs, you might look to traditional male roles, but surrounding cards will provide the most information about a possible job. Health: Ailments unique to men, such as those involving the male genitalia. Love: A relationship with a significant man is on its way. 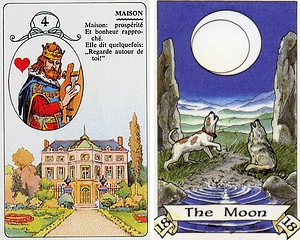 Timing: The Lenormand Man is traditionally associated with April. However, I’ve never had much luck using it as a card for timing. Cartomancy: The Lenormand Man represents the Ace of Hearts. It means joy, happiness, satisfaction, and contentment.